Does the climate system have a "Dual" control? The **** adjust passenger/driver temps separately. Last edited by toyomoho; 02-01-2019 at 08:27 PM. Does the climate system have a "Dual" ****? The **** adjust passenger/driver temps separately. Yes, it has dual climate controls. It works on the passenger side but not the driver side. Would suspect an air blend door motor has failed. This door opens/closes to change the mixture of hot/cold air to the vent. The motor under the driver's side dash near the gas pedal appears to be moving properly. How do I access the blend door to ensure it is connected to the motor properly? See link below for location of actuator. Typically if the actuator motor is working the door is moving. Its the motor that typically fails. 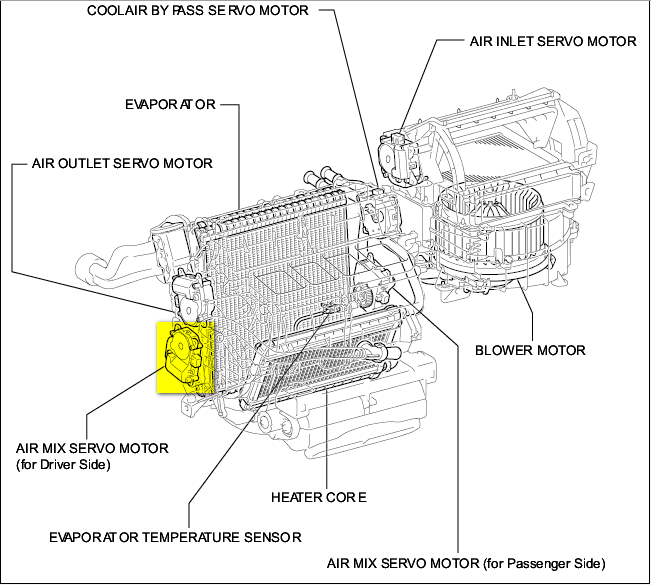 Also check coolant level and Freon level in A/C. There may be a sight glass on the A/C dryer to allow watching Freon fluid action during compressor on/off operation. Yes, that motor is moving and cog is properly aligned. If the Freon level is too, one side can blow hot. 87 Camry question about Engine cutting off only when hot.